Leo is a fixed fire sign. Two Leos together can gas each other’s egos up or tear one another down in a vicious cat fight. Both are fixed signs, meaning that they are stubborn in their beliefs and change is not something they feel they need to do. Love and accept them as they are should be a Leos motto. 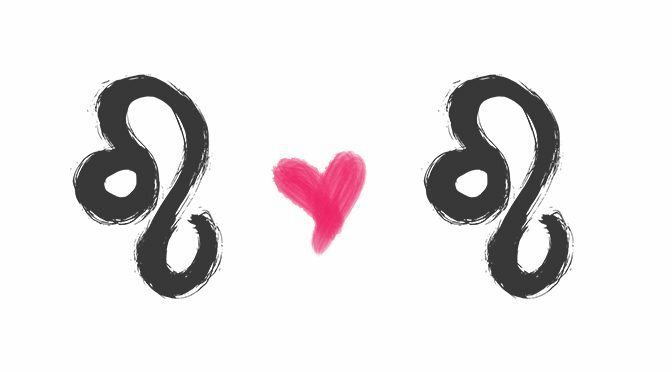 If they have other signs in their birth charts that balance them out and makes one of them less fiery or demanding, then this has a chance of working out for a while. Leo is a very passionate and highly affectionate sign that loves to love and wants to be loved. They are known to hog the stage – wherever that stage is. But when they’re on, they entertain. They are very charming, and their energy is warm and inviting. Like their fire siblings, they are aggressive, physical, passionate, and highly positive. Unlike their fire siblings, they are much more emotional, dramatic, highly protective, and fiercely loyal. As a fixed sign, they are truly very stubborn and won’t budge if anyone makes demands – they are the only ones who can make any demands. They have big dreams and big goals – everything to them is grand and possible. They want to live a comfortable life full of worldly possessions and would rather much work smarter not harder for it. They can seem a bit over the top with everything and everyone, but that’s what makes this sign very special. When in love they can be very flexible and will meet their lover halfway. They make excellent spouses due to their undying love and loyalty. However, they can often times be very spoiled and will want what they want, when they want it. Saying no to them is an insult. Like a lion/lioness, they love to be in control and will want to make sure that their pride/family is well-taken cared of. They are highly generous and nurturing, and will make sure their king/queen is treated like royalty, so long as you do the same. If you aren’t making them your number one priority, you will be met with a lot of aggression and high tempers. If you really provoke them then you can say goodbye to their warmth forever. They don’t like to play games, so make sure if you’re getting with one that you’re in it for long-term. Love, affection, and devotion to them is a requirement. So bow down or bow out. When two Leos meet it will be as if they are looking and dating a mirror image of themselves. They will be excited that someone understands all of their needs and wants in the beginning. However, those same qualities can also get on their nerves. Generally speaking, there won’t be a balance for these two and will cause a rift between their energies. What they will like the most about their relationship is the passion and affection they’ll give one another; however, they’ll hate that they are both stubborn and demanding. Both will be unwilling to bend unless it beneficial to their own needs and wants. If they are striving for a long-term relationship, then one it is obvious that one of them will have to bow out. This can get hard if one of them is more aggressive than the other, since Leo is a masculine and very dominating sign. If there is a Leo female involved, then she will may have to be more willing to allow her Leo king to dominate the relationship. Whereas, the Leo male will have to learn how to curb his own ambitions to allow her to shine and feel special. If they can find a balance between their egos, then cat fights can be prevented. This isn’t a horrible relationship, but the crown is heavy and sharing isn’t in the cards for either of them. Do you have experience with a Leo? Share it with me on Facebook.